As the United States transitioned to an increasingly urban society, it was inevitable that rural music traditions like the blues would evolve, too. The next two recordings are early examples of that shift to a new, more polished blues sound. 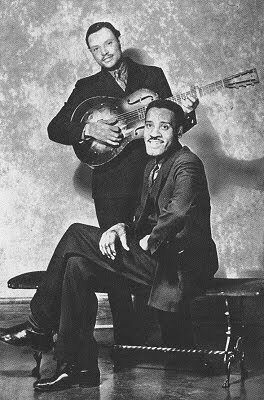 Hailing from Indianapolis rather than from the deep south, pianist/vocalist Leroy Carr and guitarist Scrapper Blackwell were pioneers of a new, “urban” blues sound. Carr and Blackwell created a more sophisticated sound that retained the spirit of country blues, but with the rough edges smoothed out and a decidedly jazzier feel. “How Long, How Long Blues” was the duo’s first hit and would remain their signature song until Carr’s death in 1935. Carr’s smooth, pleasant singing style bears little resemblance to the loud, rough style of many previous blues artists, but still manages to capture the emotion of the song incredibly well. Blackwell’s jazz-like, single-string guitar technique is simply amazing to hear, and it combines beautifully with Carr’s rolling piano to provide a soulful, melancholy backdrop throughout the record.